25 Word Description — TriCaster 860 is a complete, integrated solution for delivering big live productions in native, full-resolution HD, to meet tough demands and produce the best in a highly competitive marketplace. 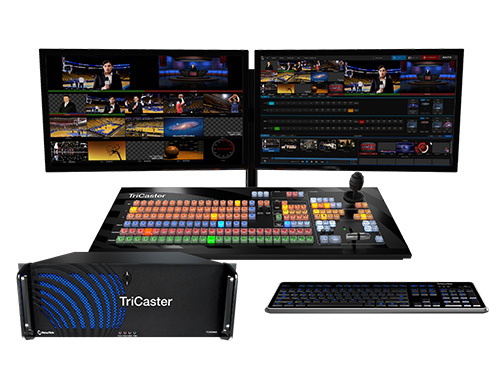 50 Word Description — TriCaster 860 is built for performance, rigged for power, and sized with the capacity to add more new shows, take on more clients, and create more programming that you can distribute quickly, unlike higher-channel solutions or dedicated broadcast switchers that cost more, require further investment in third-party equipment, and still have fewer capabilities. 150 Word Description — The TriCaster 860 is a complete, integrated solution for delivering live productions. With network-quality production value in native HD, creative freedom to meet every brand standard, and a fully-loaded 24-channel switcher with up to 18 sources plus additional video, text, graphics, animations, and virtual sets, the TriCaster 860 lets you meet viewers on their own home turf with built-in Web streaming, broadcasting, recording and projecting. All at the same time. And all in a single-box solution. Unlike higher-channel solutions or dedicated broadcast switchers that cost more, require further investment in third-party equipment, and still have fewer capabilities. Built for performance, rigged for power, and has the capacity to add more new shows, take on more clients, and create more programming that they can distribute quickly. And with industry-standard SDI video, plus robust format compatibility and a litany of file types, the TriCaster 860 eases into your workflow and handle your unique needs.